Each year, when I see blueberries I immediately think about veal. Veal, not muffins or pie, you may ask? Absolutely. All I can say is you have got to try this recipe. 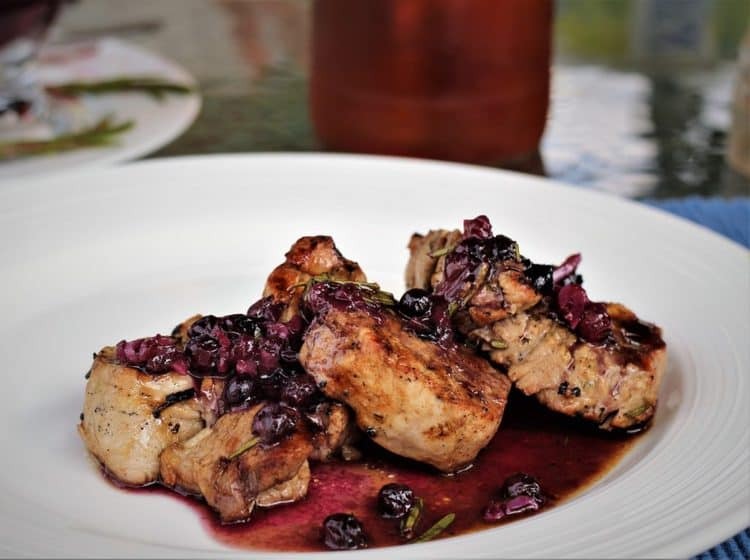 Blueberry sauce and veal are a match made in heaven. This is the only time of year I can make this dish since our local blueberries from Lac St-Jean (Quebec) are the only ones that will do. There is nothing that compares to the sweet flavor of these tiny blueberries. Luckily I receive a shipment of these blueberries each year by my husband’s colleague who picks them himself and when I receive them I head out to buy my veal. 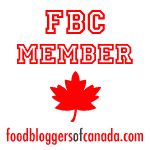 This recipe was inspired by a pamphlet on Quebec veal that I picked up years ago. This is by no means an inexpensive dish. The veal alone costs me about 40.00$ (for 4 servings) but I promise you, you’ve never tasted veal so tender, it literally melts in your mouth. I prefer buying a whole piece of veal tenderloin which I slice myself into 1 inch pieces. Just picture smothering this veal in a marinade made with blueberries, port, rosemary, garlic and olive oil. After you’ve grilled the veal you reduce the marinade until it becomes a thick purple sauce which you serve with your meat. Even the toughest critics (have you met my kids!) look forward to it each year. So, have I convinced you yet? 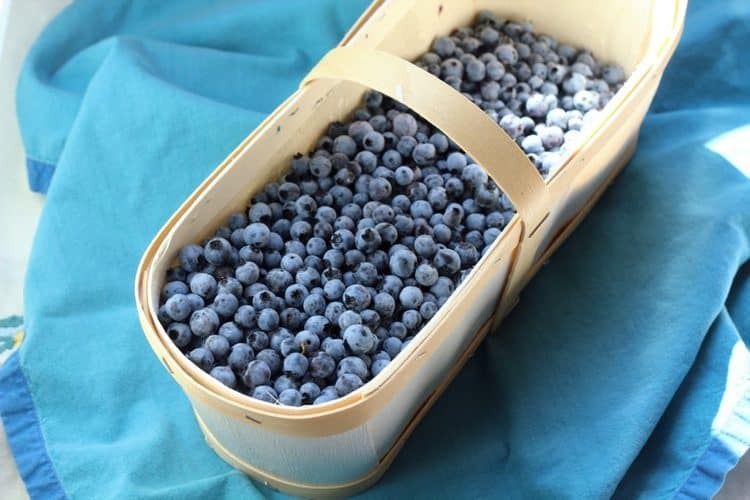 Lac St-Jean blueberries are still available in Quebec so you’re still in time to head out to buy them and prepare this recipe this weekend. You will not be disappointed! 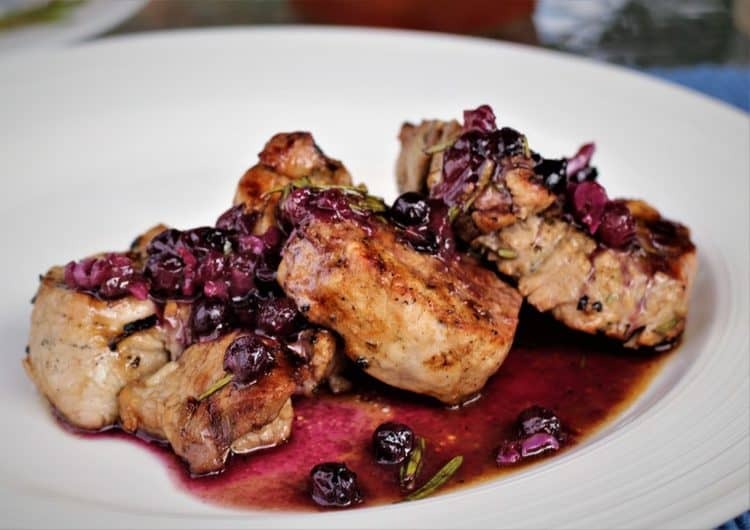 Veal with Blueberry Port Sauce made with Lac St-Jean (Quebec) blueberries is perfect at this time of year. 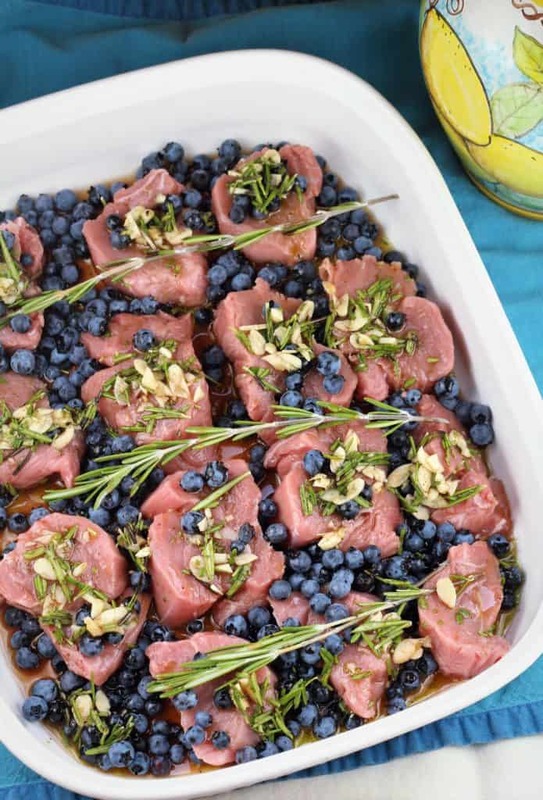 The sweetness of the blueberries and port is the perfect accompaniment for veal tenderloin. In a small bowl, combine all of the marinade ingredients and stir. If you have purchased a whole piece of veal tenderloin, slice into 1-inch pieces. Place your veal medallions in a shallow dish and cover with the marinade. Refrigerate for at least two hours. Heat your grill on medium high. Remove the veal from the marinade, reserving the marinade. Grill the veal until desired level of doneness, preferably medium or the meat will become tough. Add salt, to taste. Meanwhile pour the reserved marinade in a small sauce pan. Bring to a boil then lower to a simmer and cook until thickened, about 5 minutes. Remove the rosemary branches. 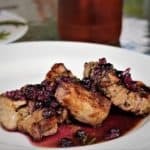 Serve the veal with the blueberry sauce.